So you’ve decided 2019 will be the year you start a blog and make money from it, but you don’t know where to begin. In this guide, we’ll look at the basics of getting a blog up and running, and some methods you can use to monetize it. We’ll start with the basics of choosing a blog platform. When starting a blog with the aim of making money it may be tempting to use a free blogging platform. Don’t. Using a free blog platform will severely limit your options when it comes to monetization, so it’s something you should avoid. You can learn more about why you shouldn’t use a free blogging platform in this guide. So if free blogging platforms are out of the question, what should you use to set up your blog? Well, there are plenty of options out there, but you’re likely to find that WordPress is the easiest to use. GoDaddy offers specialist WordPress hosting packages, which takes all the hassle out of getting your blog up and running. And if you opt for an annual plan, you’ll also get a free domain name. On the subject of domain names, you need to pick one that’s short and relevant to what you’ll be blogging about. It might be something as simple as your name (if your name is still available as a domain name), or it might be a clever name that relates to your chosen blogging niche. Whatever you pick, you need to ensure the domain name will be relevant to your blog now and in the future. So make sure you have a solid idea what you’ll be writing about before you buy your domain. You can find more advice on what makes a good domain in this guide. And you can search for a domain name below. One of the best things about WordPress is how easy it is to customize. So although you can use a pre-designed template to get your blog up and running quickly, you’ll probably want to spend a bit of time working out exactly how you want your blog to appear to readers. Will I be posting a lot of photos and/or videos? Do I want custom graphics (such as a blog logo) on my blog? How do I want my blog homepage to look? What do I want my site navigation to be like (this is a hugely important and complex topic). You may find one of the free templates offered by GoDaddy is perfect for your blog, but if you want something a little more advanced you’ll have to pay for a theme, so make sure you pick one that matches your needs exactly. You can find a wide selection of themes of Theme Forest and Template Monster. 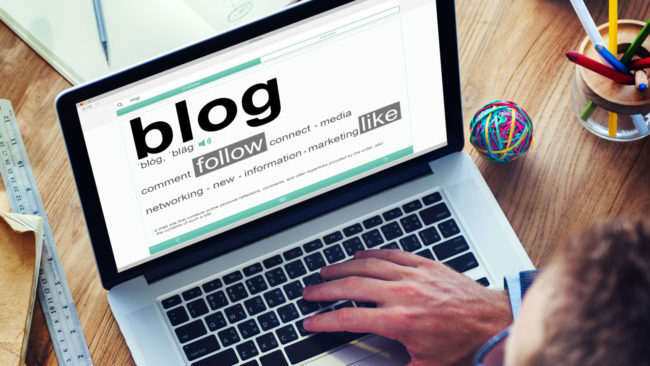 We’re going to assume you already have a good idea of the general topic of your blog. If not, this guide will help you decide what to blog about. So what we’re going to focus on in this section is the importance of publishing regular content to your blog. You don’t have to publish every day (though if you can, that’s great, but you should aim to publish at least once a month (ideally more). Leaving a long gap between posts can make it harder to build up an audience. You also run the risk of grinding to a halt completely, as a long gap can keep getting longer. So develop a content calendar and keep it full of ideas. You can learn about creating a content calendar here. You should also aim to finish articles well ahead of time where possible. WordPress allows you to schedule posts for a future date, allowing you to stick to your calendar even when you’re not in front of your computer. Any form of blog monetization requires you to attract readers and to do that you’ll need to promote your blog. In this section, we’ll briefly cover the main ways you can attract readers and link to more in-depth guides. Search engine optimization (SEO) is hugely important for any website. Good SEO is the key to ensure your website can be found via search engines. There’s a lot to consider, from site structure to keyword research. Ranking well in search engines will be particularly important if you’re planning to generate income through affiliate links (see below) as you’ll need to identify the right keywords so people interested in the products you mention on your blog will see your site when they search online. You can learn about getting started with SEO in this guide. Growing a social media following is a great way to attract an audience to your blog, but it’s not easy to do. Identifying the places where people who are interested in what you write about is a good place to start. It’s probably easiest to do this on Twitter as it attracts a wide range of people with a wide range of interests. At the very basic level, you can use hashtags to identify people with shared interests. You can also use specialist tools to identify influencers who talk about the subjects covered by your blog. This is another great way to get your content in front of the right audience. You can learn about how to get started with social media in this guide, while this guide covers getting started with influencer outreach. Blog commenting has something of a bad reputation because it’s often used as a spam tactic. But done the right way, commenting on other people’s blogs can be a great way to build relationships within the blogging community and get your content in front of a new audience. Always make sure any comments you leave are relevant and insightful. If there’s the option to leave a website address as part of a comment, feel free to include your blog’s homepage. But only link directly to one of your blog articles in a comment if it’s 100% relevant to the discussion. You can learn more about promoting your blog through blog commenting in this guide. Email marketing can’t really help you attract new readers to your blog, but it can help you keep existing readers coming back for more. By encouraging people to sign up for your email newsletter, you can ensure a regular flow of engaged and loyal readers. To do this, you’ll need a tool like email marketing from GoDaddy. This guide covers the basics of getting started with email marketing. There a two main ways to monetize your blog directly, as well as a few ways you can use an established blog to indirectly generate an income. Let’s look at the two direct methods first. When people think of monetizing a blog, they’re generally thinking of making money through including adverts on a blog. The main way to do this is by using a service like Google AdSense. AdSense allows publishers to include ads on their site which are targeted based on your site’s content and audience. You can learn about getting started with AdSense here. It’s important to be realistic about how much income you’ll be able to generate via ads. You’re probably going to need to attract tens of thousands of visitors (if not more) every day to generate a significant amount of revenue. You might not know the term affiliate marketing, but you will have undoubtedly visited websites that make money using it. Affiliate marketing works through a business rewarding people who attract customers on its behalf. For example, if you were to join the Amazon affiliate programme, you’d be rewarded every time someone bought a product because you mentioned it in one of your blog articles. A huge number of companies offer affiliate programmes, so it should be easy to find one that matches the topic of your blog. If you can find an affiliate niche that looks particularly lucrative, you may even want to set up a blog focused entirely on that subject. You can learn more about getting started with affiliate marketing in this guide. A note about GDPR: Both advertising and affiliate marketing track your website visitors, so make sure that any monetization methods you use comply with GDPR. Other ways you can indirectly monetize a blog include launching a consultancy service based on your blog (this is particularly useful if you’re blogging on business-related topics). You might also want to sell your writing services, using your blog as an example of your talents. It’s even possible to use your blog as the launch platform for a product. Launching and monetizing a blog in 2019 is still possible, but it isn’t easy. Your initial focus should be on building a blog that features high-quality content and attracting readers. Then you can start to look at ways of generating an income from your blogging. Is it still profitable to operate an online casino in 2019?